Can LG muster up a new flagship range of phones? 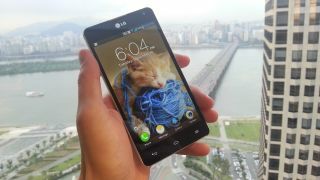 LG has used its CES 2013 press conference to confirm it will be bringing a 'tier one' smartphone to market. James Fishler, senior VP of marketing at LG, took to the stage to state that the company was looking to bring a range of top-end smarpthones to the market in 2013. "At MWC next month, and throughout the year, we'll be bringing more tier one handsets, in various screen sizes," said Fischler. Will it be a phone? Will it be a tablet? This ties in with some strong rumours that the Korean brand will be looking to get into the space created by the Samsung Galaxy Note 2, meaning a 5.5-inch screen size on the next LG big launch. The phone is set to feature a full HD screen in that footprint, meaning a 1080p screen in the palm of your hand. NFC is also certain to be included given the brand has taken pains to show how it will launch interconnected home appliances and TV using the contactless technology. Word on the virtual internet streets (or superhighways) is that LG's new behemothic device will launch in March 2013, merely days after it's announced in Barcelona, as the Korean firm looks to ape Apple in removing the waiting time between launching and actually putting products on shop shelves... but we won't hold our breath on that one.